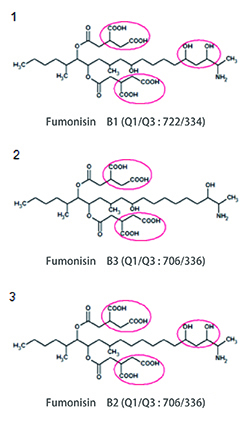 LC/MS/MS analysis of fumonisin mycotoxins using a metal free column | YMC CO., LTD.
Fumonisin mycotoxins have coordinating ability to metal ions. Coordination compounds tend to adsorb onto column hardware and/or tubings that are made from stainless steel. This adsorption can be a cause of poor peak shape or sample carry-over. YMC-Triart [metal free column] is effective for coordination compounds and contribute to reliable analysis. 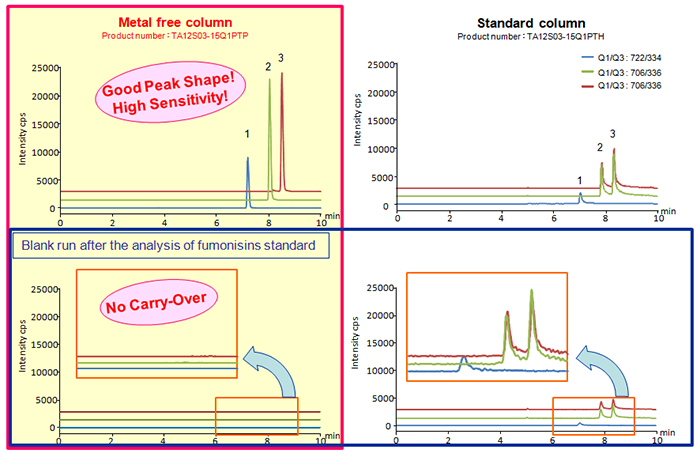 The metal free column showed excellent peak shape on Fumonisins analysis, while the regular column showed severe tailing peak shape due to interaction between the sample and the hardware. No carry-over was observed on the metal free column, while the regular column had sample carry-over caused by adsorption of the sample on the hardware. The YMC Triart C18 metal free column gives excellent peak shape for these coordination compounds and contributes to reliable analysis. YMC-Triart C18 (3 μm, 120 Å), 150 X 2.1 mmI.D.